Very Beautiful Mounted In Black & White Lovely Lady with A Flower Cameo Pendant Sparkling silver Casting frame with Bow fully embedded with cubic zircon. The boundry of pendant is decorated with Silver Casting Wire & embedded with Cubic Zircon. This magnificent & Pendant of Cameo Lady. Perfect with any outfit Superr Grade RARE HIGHEST QUALITY. Good shinning surface quality with unique attractiveness & fashionable flair to this stylish. What is in this season? Check this out! 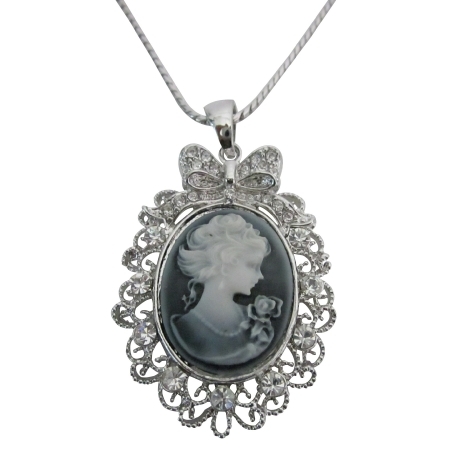 Necklace a trendy piece with beautiful Cameo Lady Pendant Necklace a perfect piece for anyone to wear for a formal or casual occasion.